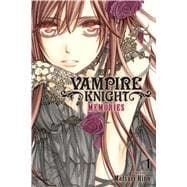 Immortal tales of the past and present from the world of Vampire Knight. Vampire Knight returns with collection of stories that delve into Yuki and Zero’s time as a couple in the past and explore the relationship between Yuki’s children and Kaname in the present. After a fierce battle between humans and vampires, a temporary peace was established, but Kaname continued to sleep within a coffin of ice… Yuki gave Kaname her heart to revive him as a human being. These are the stories of what happened during those 1,000 years of Kaname’s slumber and at the start of his human life. Matsuri Hino burst onto the manga scene with her title Kono Yume ga Sametara (When This Dream Is Over), which was published in LaLa DX magazine. Hino was a manga artist a mere nine months after she decided to become one. With the success of her popular series Captive Hearts, MeruPuri, and Vampire Knight, Hino has established herself as a major player in the world of shojo manga.